Paradigm Winery and Vineyards represents five generations of agriculture in Yountville and Oakville soils. We are a small family run business. Our premium wines are estate bottled in Oakville California. We produce Cabernet Sauvignon, Merlot, Zinfandel, Cab Franc and Rose wines under the winemaking direction of Heidi Barrett. We pride ourselves on offering informative tours and tastings in a casual atmosphere. The view from the tasting room across the vineyards towards the Mayacamas Mountains is spectacular. We are open 7 days a week for tours and tastings by appointment, 800-963-1683. We are open 7 days a week 10-4 scheduling appointments on the hour. 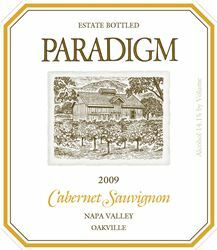 To join the wine club, visit www.paradigmwinery.com or call 707-944-1683. The New Release Club – a twice yearly shipment of our new releases: six or twelve bottles of Cabernet in the Spring & one bottle each of Cab Franc, Merlot, Zinfandel & Cabernet in the Fall. The Cabernet Lovers Club – 12 bottles of new release Cabernet in the Spring & a bottle each of cabernet sauvignon, zinfandel, merlot and cabernet franc in the fall. Club members will also be given the opportunity to buy additional wines including a Holiday Season gift pack at a preferred price. Club members also receive an invitation to our annual Wine Club Party. Our club members are invited to the annual Paradigm party held the second weekend of June.